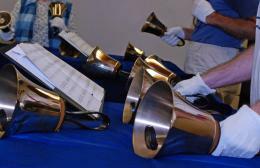 This group of talented hand bell ringers provides music once a month for the regular Sunday morning worship service, September through May. We rehearse for an hour every Wednesday evening at 5:30 p.m.
Special music during Lent and Advent is offered by people who love to sing. Rehearsals are on Sunday mornings after worship a few weeks prior to the date . Singers of all ages are welcome to join.